The domestic campaigns around Europe are set to come to a close later this month, which means it’s officially time to start getting excited about the upcoming World Cup. The world’s biggest football tournament will go down in Russia starting in mid-June, and each of the 32 teams involved is in the process of making final decisions and preparations. If you’re new to betting, you still have plenty of time to familiarize yourself by learning about different odds and how they work. As of now, Germany are installed as the favorites to win the World Cup after their 2014 triumph in Brazil. However, winning back-to-back World Cups is rare. Brazil are the only side to have ever done so, back in 1958 and 1962, respectively. Speaking of Brazil, they’ll be looking to bounce back following a disappointing 2014 effort in their home country. The Brazilians are as loaded as ever, so they need not be overlooked. France, Spain and 2016 Euro champs Portugal will all be in the mix, as well. With the group stages on the horizon, which matches in the first section of the tournament should we be looking forward to watching? The headliners of Group B will do battle in the first fixture of the group stage. The European neighbors have each enjoyed major success in recent years. As just mentioned, Portugal were a surprise winner of the Euro 2016 tournament in France, while Spain won the 2010 World Cup in South Africa. However, both sides were rather disappointing in 2014 in Brazil. Spain slogged its way to a third-place finish in Group B behind the Netherlands and Chile, while Portugal finished third in Group G behind Germany and the United States. Spain went 1-0-2, while Portugal went 1-1-1. Spain’s roster is a mix of the old guard and fresh young talent. Still remaining from the 2010 World Cup champs are fixtures like Sergio Ramos, Gerard Pique and Sergio Busquets. Andres Iniesta is also set to represent the Spaniards in what figures to be his final World Cup appearance. Some of the new faces bring more excitement. Diego Costa looks guaranteed a spot despite the fact that he has struggled to make his mark with Spain in the past. Real Madrid’s duo of Marco Asensio and Isco look like locks, as well. Ditto for Atletico Madrid’s Saul and Koke. Perhaps most important, the Spaniards figure to have arguably the world’s best keeper in goal in David De Gea.We know the deal with Portugal by now. The Portuguese are a side that would prefer to sit back and defend rather than put on a full-on attack. This despite the fact that they have one of the greatest players of all-time in Cristiano Ronaldo, who will be looking to bounce back after leaving the Euro 2016 final injured.There are quite a few familiar faces in this side, including Nani, Bernardo Silva, Jao Moutinho and Pepe. In all, this is just a very solid team that will prove a tough foe for anyone. Will this be the year that Lionel Messi finally leads Argentina to glory? They were close in 2014, but the Argentines ultimately fell in extra time at the hands of Germany in the World Cup Final. Argentina also bowed out in the final of the 2016 Copa America Centenario after losing in the final to Chile. Messi was so distraught after the Chile defeat that he announced his retirement from the national team, but few actually believed him at the time. He unsurprisingly returned, however, and he will be leading the charge once again on the international stage this summer. Of course, it’s not just Messi. This side is loaded with talent, which makes their struggles on the biggest stages even more of a curiosity. The Albiceleste have cycled through a number of coaches through the qualifying stages before ultimately landing on Jorge Sampaoli to lead them to Russia. Messi missed the team’s recent 6-1 thrashing against Spain in a friendly, which has to be quite concerning. Still, look at the rest of the squad. Manchester City’s Sergio Aguero figures to be leading the line at the top, with Nahuel Guzman serving as the team’s second-choice striker. Gonzalo Higuain is also expected to make the roster. The midfield is loaded with talent such as Angel Di Maria, Ever Banega and Lucas Biglia. The defense of Nicolas Otamendi, Marcos Rojo, Javier Mascherano and Gabriel Mercado looks solid, too. On the other side we have Iceland, who captured the attention of the world with their shockingly deep run at Euro 16. This will be Iceland’s first ever trip to the World Cup, so you can be sure they’ll make the most of it. Unlike their counterparts, Iceland’s squad isn’t exactly littered with household names. Gylfi Sigurdsson is the most decorated player on the roster, and he was instrumental in the side’s push into the Euro quarter-finals. Iceland showed in France in 2016 that they are a side that is unafraid of the big moment, and it will be interesting to see how they approach a power side like Argentina. The Russian capital city will host the defending World Cup champs’ first fixture in their quest to repeat. The Germans should have little issue getting out of a group that features Mexico, South Korea and Sweden. Mexico will be their toughest foe, and they get the chance to face them right out of the gate. Germany put forth a youthful side at last summer’s Confederations Cup and still managed to win it, so this is a team with plenty of depth. Joachim Low’s has plenty of decisions to make, but the 2018 squad will look quite similar to the ‘14 edition. Bastian Schweinsteiger and Miroslav Klose are gone, but Thomas Muller, Andre Schurrle, Sami Khedira, Jerome Boateng, Mesut Ozil Manuel Neuer and others are set to defend their title. Marco Reus was injured during the last tournament in Brazil, but if he’s fit we can expect the Borussia Dortmund man to add even more pace to a side filled with speed. As for Mexico, they were beaten in the knockout stages of the ‘14 World Cup by the Netherlands after a cruel penalty decision went against them. Juan Carlos Osorio took over for Miguel Herrera, and the Mexicans are hopeful that they can make some noise in the tournament for the first time in several years. Knocking off the defending champs would certainly raise some eyebrows. Javier “Chicharito” Hernandez remains the team’s talisman up top, though there are a couple of other key players facing injury issues. Both Carlos Salcedo and Nestor Araujo sustained injuries leading up to the tournament, and there is no word at this point whether either player will be healthy enough to make the trip. Guillermo Ochoa, who burst onto the scene in Brazil in 2014, is set to reprise his role as El Tri’s starting keeper. The rest of the side isn’t full of familiar faces, though MLS fans will be familiar with LAFC’s Carlos Vela and LA Galaxy’s Giovani Dos Santos up front. Hector Herrera, who plies his craft professionally with Porto in Portugal, will also feature. All eyes will be on the Brazilians to see how they rebound from the disappointment of 2014. 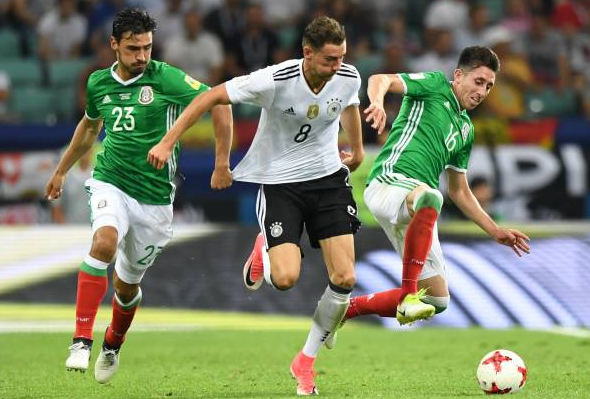 The team wilted under the pressure of serving as the host nation, and they were embarrassingly trounced by Germany 7-1 in the knockout stages. The Brazilians have won Olympic gold since, however, and a revamped side will take the pitch in Russia free of the host nation pressure. Neymar suffered a serious foot injury with Paris St. Germain earlier this season, but he’s set to return to the squad shortly, which should ultimately clear him to play in Russia. If you go based on name recognition alone, Brazil have what appears to be the most loaded roster in the world. In addition to Neymar, who may well be the world’s second-best player right now, manager Tite can litter his side with world class talent. You have Philippe Coutinho, essentially Neymar’s replacement at Barcelona, providing pace on the wing. Alisson Becker is likely the No. 1 goalkeeper, though the backup, Ederson, isn’t much of a downgrade, if any. Liverpool’s Roberto Firmino, Coutinho’s former teammate, present a goal scoring threat up front. Willian, Fernandinho, Gabriel Jesus, Marcelo, Casemiro, Thiago Silva, Dani Alves…go down the list and everybody here is a star. The Brazilians will look to get off on the right foot against an undermanned Switzerland side. Xherdan Shaqiri will bring his jitterbugging, darting runs to the midfield, but there’s not much else here to get all that excited about. Perhaps the toughest test for Messi and Argentina will come on June 21 when they take on a talented and underrated Croatia squad. Croatia isn’t the most talented team on paper, but they do arguably boast the most dynamic midfield of any squad in the tournament. Three of the players recently went to battle in the El Clasico between Barcelona and Real Madrid. Ivan Rakitic took the field for Barca, while Luka Modric and Mateo Kovacic lined up for Real. In addition to those three, the Croatians can also call on the likes of Milan Badelj and Marcelo Brozovic if they so choose. Modric is the engine that drives the team forward and makes everything happen, as he does with Madrid. Ivan Perisic is another winger/attacker that has established himself as one of the best players in Italy for Inter. This figures to be one of the better group matches between a couple of sides with potent players in midfield.